Munich - As the German top tier's only ever-present club, Hamburger SV must be doing something right. The three-time Bundesliga winners are yet to be relegated from Germany's 52-year-old division, but they went mightily close in 2013/14. "We've got to work on our self belief," HSV head coach Slomka told hsv.de on the back of a campaign of unheralded disenchantment at the Imtech Arena. "The players have got to realise what their bodies are capable of and just how far they can push themselves without doing any harm. We've been trying out lots of things [during pre-season] and it's going much better now." Looking back, Slomka's appointment with 13 games left on the league calendar represented something of a masterstroke; even if it took a precarious but definitive play-off victory over Bundesliga 2 side SpVgg Greuther Fürth to see 16th-in-the-table Hamburg over the line. The Bundesliga's very own rescue ranger had struck again. After steering Hannover 96 away from impending relegation during the second half of 2009/10, Slomka took the club to within five points of a place in the UEFA Champions League in 2010/11. Two seasons of UEFA Europa League football followed, before the 46-year-old took his leave in December 2013. The irrepressible tactician returned to football at HSV just 52 days later. Now preparing for his first full season at the Hamburg helm, Slomka has drawn on methods old and new as he plots the resurrection of his former employer's great northern rivals. 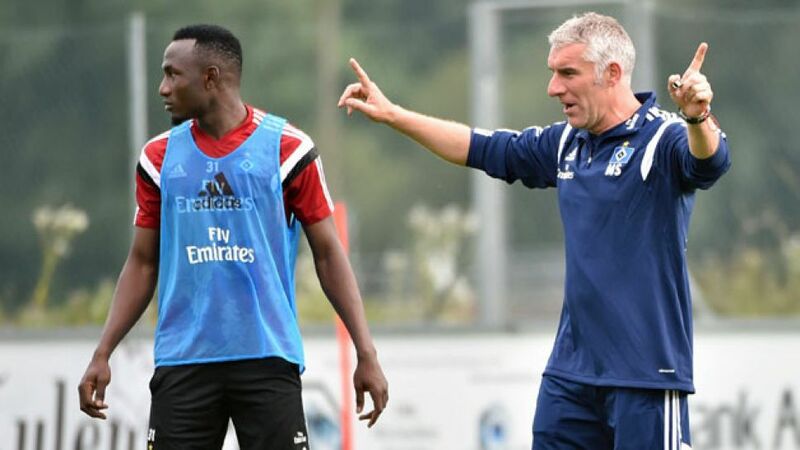 Hannover enjoyed many a fruitful summer at HSV's current pre-season station in Stegersbach, Austria, albeit without the state-of-the-art bonus of GPS tracking vests. "We already have a basic picture, but the new tool allows us to see who moves and how," he explained. "I want to know if the work rate is higher during games than it is during training." With the trials ongoing, perhaps the clearest measure of Hamburg's progress during the summer months is the club's performance at the Telekom Cup. Only a penalty shoot-out defeat to VfL Wolfsburg denied them a place in the final, before a comfortable 3-1 win over Borussia Mönchengladbach saw HSV take bronze. The return to fitness - and form - of captain Rafael van der Vaart has certainly helped, while Slomka's reintroduction of Gojko Kacar - back in the fold following a loan spell at Japanese outfit Cerezo Osaka - appears to have galvanised a back four that haemorrhaged a league-high 75 goals last term. "Rafael's really lively and agile," enthused HSV's tactician. "He's a team player and things are going well for him [...] Gojko's been playing well at the back, but he can also play in midfield. There's definitely still more to come from this team." For a club that found themselves teetering on the brink in May, and especially given 2013/14 saviour Hakan Calhanoglu's recent transfer to Bayer 04 Leverkusen, that must come as music to the ears of the HSV faithful. It's still early days, but Slomka's Hamburg might just have turned a corner.